While many loyal Apple fans may strongly continue to claim the immortal superiority of the iPhone and the iOS operating system, it is inarguable that they are well forced into competition by rivals such as Android. iPhone is no doubt the very symbol of the birth and conception of smart phones and mobile technology, but perhaps there are matters and elements wherein its rivals cater better to the public at large. Android is an operating system widely available on most smart phones today that provides for heaps and heaps of creative control and personalization. After all, with all the fun and custom setting that come with smart phones, everyone wants a personally set up and laid out phone and android provides for this demand rather magnificently. Android smart phones allow for the customization of smart phone on a level that is very difficult to compete with. The Google Play market is home to several applications that allow for android smart phones to be fully and freely customized with a variety of themes, icons, widgets, lock screens, homescreens and several other features. The most popular in the android market these days are Go launcher, ADW Launcher, SS Launcher and several more which we’re sure you’re only too familiar with. These amazing launchers allow users to customize and personalize their phone screens down to the very last pixel, so to speak. 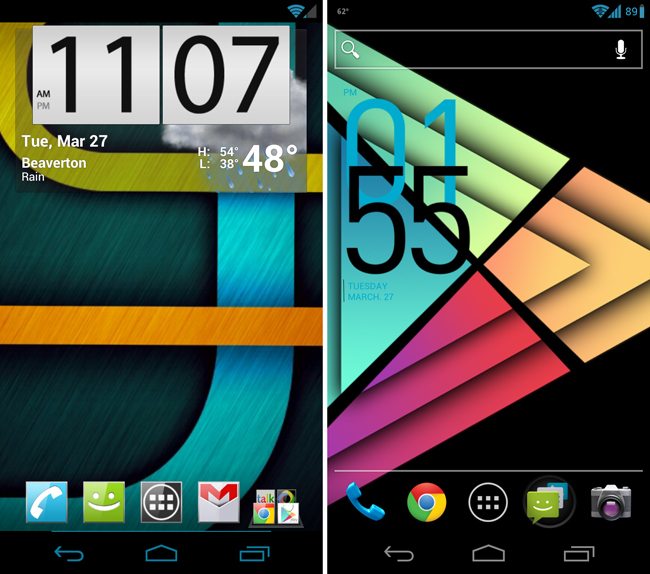 From funky homescreens, to swipe locks, and clocks to so much more. We have collected for you a collection of some truly amazing android homescreens and themes for you below so you get an idea of just how far you can go with making your phone truly your own. The images below are mostly screenshots from android phones and are in the form of different homescreens and themes designed for the various different launchers used by android users to customize their phones. You’ll find below a showcase of super elegant, sleek, funky, minimalistic, artsy fartsy, funky and graphic themed homescreens, icons, wallpapers and several more features presented in a beautifully designed layout. Have a look at the stunning options below and enjoy.